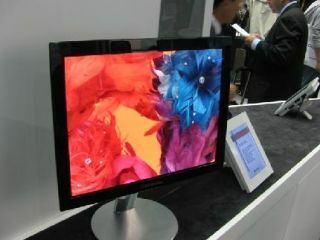 Not wanting to be left out of the OLED TV race currently dominated by Sony and Samsung, LG has shown off its own 19in model at the International Meeting on Information Display. But then the president of LG Displays, the company that's getting all LCD happy, has said it won't be investing in the technology to produce larger OLED screens. LG's reticence to get involved in OLED production is partly due to a lack of vendors to sell the screens to, says Kwon Yung-Soo. "Expect for Nokia, no company shows aggressive leadership. Considering productivity and original cost, there will be no big investments for AM OLED." In the early days of OLED development, LG was one of the companies investing heavily in moving to the production stages. But it has decided to only make small screens for portable devices, despite its larger prototype. The screen on display at IMID was a 19in little beauty, though was dwarfed by the bevy of Samsung OLED screens dotted about, showing a 31in 'screen of the future'.